main season from chf 159.- p.P. low season from chf 109.- p.P. Our Studios are generously built 1-room apartments with 2 beds, in addition to a couch that is functional as another bed, an own kitchen, a flatscreen TV, free WiFi, elevator and balcony. You also get your own parking spot for free. In our prices, we include costs for bed sheets, cleaning service, tax etc. (excluding spa tax). Studios don’t have room service included, but can be agreed upon. 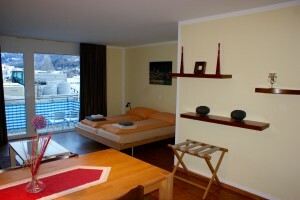 During the winter season, you can have dinner for chf 24.- per person in the hotel. Great view with much comfort and generous space.